Originally published on the Devpolicy Blog. Also available on Medium. Messaging apps – such as WhatsApp, Viber and Facebook Messenger – are becoming the primary mode of communication for many people around the world, including populations affected by conflict and disaster. Today, more than 2.5 billion people use this technology, a figure that is expected to rise to 3.6 billion by 2018. As these apps grow in popularity, their usage in emergencies is also on the rise. Communities affected by natural disaster, war and forced displacement are, more and more, relying on these platforms to perform tasks such as keeping in touch with their loved ones, or to remain informed. A new report, Humanitarian Futures for Messaging Apps, argues that, in many regions, messaging apps have become so widespread that they deserve to be considered strategically for use in humanitarian operations. The report, based on research led by the International Committee of the Red Cross (ICRC) in collaboration with the Engine Room and Block Party looks at how crisis-affected groups and humanitarians are currently using messaging apps, and what opportunities and risks these platforms present when employed by aid organisations. How are apps being used by crisis-affected communities? According to the report, very little high-quality, disaggregated data is available regarding which apps people are using and how they are being used by people in crisis situations. Most evidence to date has been focused on the Middle East, particularly Syrian refugees. More work is needed to understand the levels of access to these apps, how frequently they are used in comparison to other channels such as social media, and what they are used for. Globally, the usage of smartphones and messaging apps is on the rise, however obviously it cannot be assumed that this trend applies to all communities, in all contexts. For instance, UNHCR research indicates that refugees are around 50% less likely to own a smartphone than the global population as a whole. Men also report smartphone ownership at markedly higher rates than women in many countries. For humanitarians considering the use of messaging apps, it is critical to start from a clear understanding of the local information ecosystem, in order to know, specifically, why these platforms might be useful in that particular context, and to avoid initiating or exacerbating existing inequalities when it comes to access to aid. Among the crisis-affected populations that do have access to messaging apps, the reasons for using the apps are likely to differ significantly, depending on the context and situation. For example, according to recent research by the Danish Refugee Council, refugees and migrants attempting to reach Europe are likely to use apps to perform tasks such as finding data on their intended country of destination, or to access safety and rescue services while in transit. Conversely, in situations of natural disaster, people are using messaging apps to contact friends and family and access accurate information about the situation. In general, the report indicates that crisis-affected populations are often choosing to use messaging apps over other communications channels because of the rapid response rates and conversational style engendered by these apps. While most organisations interviewed as part of the ICRC’s recent report indicated they were not using messaging apps in any formalised or official way, a number of agencies reported experimenting with this technology for two main purposes: to communicate with people affected by crisis, and to coordinate tasks internally. For instance in West Africa, BBC World Service turned to messaging apps in 2014 to broadcast public health information about Ebola, reaching 19,000 subscribers in various local languages. In Yemen, people affected by war are now able to contact the ICRC using WhatsApp to report security incidents or to request urgent assistance. Significantly, the report indicates that messaging apps are able to help organisations gather information from communities in hard to reach places, where face-to-face meetings or other communications are challenging, or indeed impossible due to security concerns, official restrictions or the difficulty of travel. While the apps are providing new opportunities for communicating in challenging circumstances, the ICRC’s research shows that the systems for using these platforms are both new and largely untested, and humanitarian organisations currently have no agreed codes of conduct, standards or ethical frameworks for deploying them. As it stands, there are clear gaps in the aid sector’s understanding of the implications of introducing these apps as a communication tool in crisis situations. One of the key risks associated with these platforms is related to privacy. Currently, most major messaging apps use opaque systems for storing data that external organisations cannot independently scrutinise, which presents a range of challenges for humanitarian agencies assessing the suitability of different platforms. Using apps that do not offer suitable data protection could lead to a situation in which unintended third parties access data collected by aid organisations, for purposes that run counter to the neutral, impartial and independent nature of humanitarian work. This could include ill-intended parties who may wish to target or discriminate against some groups of people. It is clear that, at this stage, messaging apps will not be appropriate in every humanitarian situation. As with any technology, these platforms can exacerbate inequalities associated with gender, age, literacy, access to mobile phones and network connectivity. Nevertheless, the apps might offer a way of contacting individuals who might otherwise be impossible to reach. 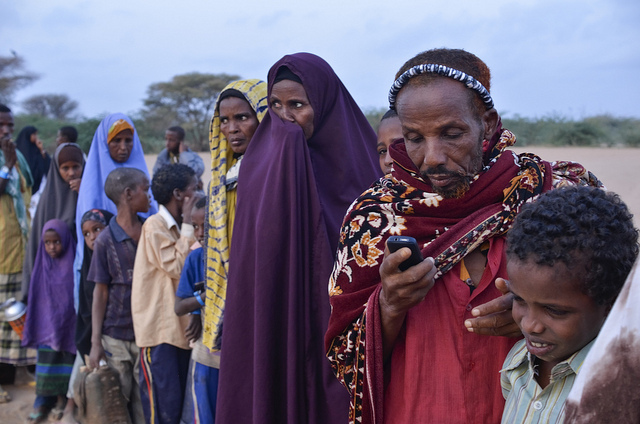 At a minimum, humanitarian agencies should systematically include questions on access to and use of mobile phone telephony into humanitarian needs assessments. A number of steps can also be taken in order to address some of privacy and data security concerns related to the use of messaging apps. Before incorporating these platforms into humanitarian work, organisations must ensure their chosen channel respect users’ rights to consent, privacy, security and ownership. The report also recommends choosing an app that, among other things, offers the users the option for anonymity and provides end-to-end encryption, which restricts the ability for third parties to intercept communications via the app. Messaging apps have great potential to make a positive impact in situations of crisis. However it is clear that the aid sector needs to better understand the opportunities and risks in order to develop responsible, effective and safe ways to use messaging apps to meet the needs of people affected by armed conflicts, internally displaced people, refugees or migrants. Andrea Lunt is Communications Officer for the ICRC Mission in Australia.